UPDATE: For the latest on the investigation into the deadly wreck, click here. NOTE: Those trying to contact passengers on the train should call the Amtrak Hotline at 1-800-523-9101. At least seven people were killed and over 200 people hurt after an Amtrak train, carrying 238 passengers and five crew members, derailed and rolled onto its side in the Port Richmond section of Philadelphia Tuesday night, according to officials. Police said Wednesday that seven people had died, after the death toll had risen to six earlier when Temple University Hospital officials confirmed one patient had died of their injuries overnight. All seven cars of Amtrak Northeast Regional Train 188 derailed and came off the tracks near Frankford Junction on the 2000 block of Wheatsheaf Lane shortly after 9 p.m., officials said. The train was heading to New York from Washington, D.C., and had six passenger cars as well as an engine. "All of a sudden it felt like the brakes were hit hard and then our car," said Michael Black, one of the passengers. "We were third from the last, just slowly started going over to the side. I tried to just brace my arm against it and then just got off." Daniel Hernandez, who lives close to the tracks, heard the derailment. "It sounded like a bunch of shopping carts crashing into each other," he said. Hernandez says the crashing sound lasted a few seconds and he heard chaos and screaming. Mayor Michael Nutter confirmed at least five people were killed in the derailment during a news conference late Tuesday. "This was an absolute disastrous mess," Nutter said. "I have never seen anything like it in my life. Many of these folks are not from Philadelphia." Nutter, who said the incident was a "Level 3 mass casualty event," did not speak on a possible cause. "We do not know what happened here," he said. "We're not going to try to speculate about that." Governor Tom Wolf arrived at the scene and spoke with Mayor Nutter during another press conference shortly after 1 a.m. Wednesday. Wolf said his thoughts and prayers are with the victims of the crash and all those affected. "I've never seen anything so devastating," said Philadelphia Fire Department Deputy Commissioner Jesse Wilson. "They're in pretty bad shape. You can see that they're completely, completely derailed from the track. They've been destroyed completely. The aluminum shell has been destroyed and they've been overturned completely." Officials say over 140 people were hospitalized and at least six of them are in critical condition. Victims were taken to Temple University Hospital, Aria Health-Frankford, Hahnemann University Hospital and the Albert Einstein Medical Center. Jefferson University Hospital treated 26 patients, the majority of which had minor injuries, according to a spokesperson. A spokesperson at Temple University Hospital says they treated at least 36 people who are in various conditions. An Aria Health spokeswoman says 26 patients were treated at its Frankford location while 50 were brought to its Torresdale hospital. Hahnemann University Hospital treated about 25 patients with mostly minor injuries and a few traumas according to a spokesman. Finally, Albert Einstein Medical Center treated 10 patients. The incident required a 4-alarm response, including 120 firefighters and 200 police officers. An emergency response staging area was established at Frankford and Castor streets. "I've Never Seen Anything So Devastating"
Philadelphia Deputy Fire Commissioner Jesse Wilson describes the scene of a deadly Amtrak train derailment and rescue efforts. Officials say they don't believe the incident was an act of terror and preliminary information indicates it was an accident. The National Transportation Safety Board has sent a go-team to investigate the derailment. Members of that team arrived early wednesday morning. NTSB investigator Mike Flanigon is leading the team as investigator-in-charge. NTSB Board Member Robert Sumwalt is accompanying the team and will serve as the main spokesman during the on-scene phase of the investigation. 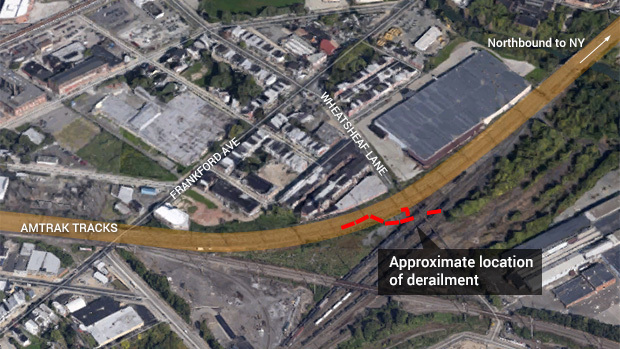 The derailment occurred at almost the exact same location of another deadly derailment 71 years ago. On Sept. 6, 1943, a Congressional Limited careened off the tracks with 541 passengers on-board, including many service members on leave. Seventy-nine passengers were killed and 117 were injured. Yameen Allworld, a Philadelphia music producer who has worked with the Roots, was on the train and posted a video on Instagram. In the video passengers could be heard crying and crawling through the sideways car. Janelle Richards, a producer for NBC Nightly News, was another passenger on the train. Richards says she heard a loud crash around 9:20 p.m. She also said people flew up in the air and there was a lot of "jerking back and forth" and "a lot of smoke." 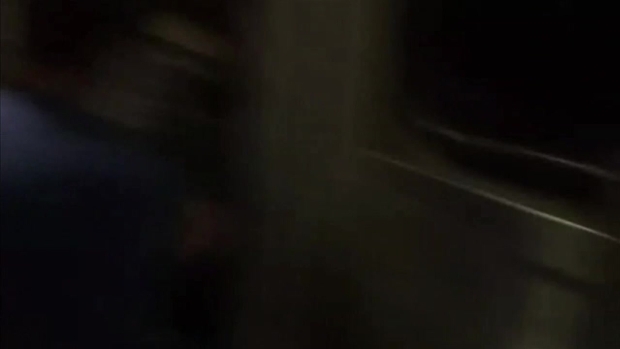 Video from NBC Nightly News Producer Janelle Richards of passengers trying to get off a train moments after it derailed. Patrick Murphy, a former congressman from Pennsylvania's 8th District and Iraq War veteran was in the cafe car when the train crashed. "It wobbled at first and then went off the tracks," Murphy said. "There were some pretty banged-up people. One guy next to me was passed out. We kicked out the window in the top of the train car and helped get everyone out." 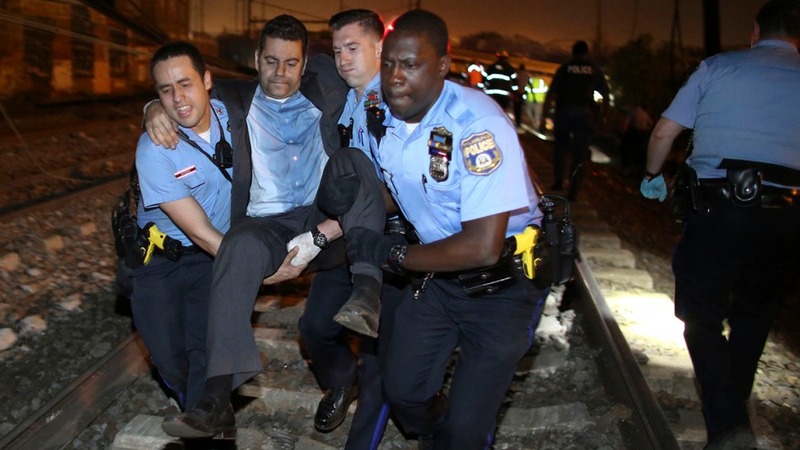 Former congressman Patrick Murphy was onboard the Amtrak train during the deadly derailment in Philly. Murphy spoke to NBC10 about what he saw immediately after the crash. Max Helfman, 19, of Watchung, New Jersey was on the train with his mother when the crash occurred. Helfman says they were in the last car of the train when they suddenly felt it shake. The car then flipped over. 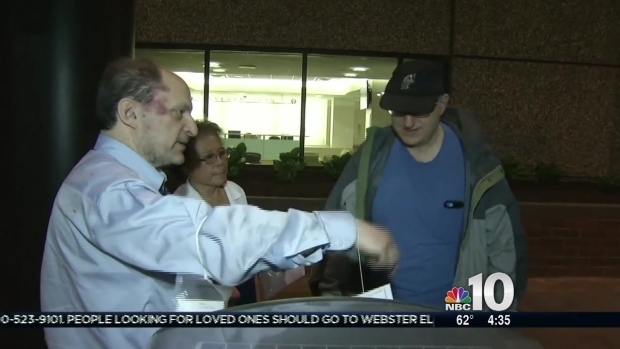 "People were thrown to the ground," Helfman said. "Chairs inside the train became unscrewed and suitcases were falling on people. My mother flew into me and I literally had to catch her. People were bleeding from their head. It was awful." Helfman says he saw smoke after the car flipped over. "We were worried it may explode so we tried to get people out of the car," he said. Helfman says he helped some of the passengers squeeze through a door that was slightly open. Responding police officers then helped them through a back door. After getting off the train, Helfman and his mother boarded a bus that traveled to Webster Elementary. "I'm scratched and may have a concussion," he said. "At this point it's hard to tell." Police and fire investigators are surveying the scene of a train derailment in Port Richmond. One victim told NBC10's Katy Zachry how he felt the train tipping. Jeff Kutler, a passenger traveling from Washington, D.C. to his home in New York was riding in the quiet car when he realized something was wrong. "It started tipping to the right and after a couple seconds, maybe it was half a secong, I realized there was nothing good going to happen here, this train is tipping over," Kutler said. U.S. Senator Tom Carper (D-Del.) was also on the train though he disembarked at the Wilmington, Delaware station about 40 miles south from where the train derailed. "I am grateful to be home safe and sound in Wilmington, and my heart goes out to all those on the train tonight," Carper said. "I hope all of those that are injured recover quickly, and I will keep them in my thoughts and prayers." Amtrak's Northeast Corridor service between New York and Philadelphia is suspended. SEPTA regional rail service is also suspended until further notice on the Trenton Regional Rail line due to the accident. A SEPTA official said it's likely the Trenton Line will be suspended throughout the day Wednesday and possibly through the remainder of the work week. Service for SEPTA's Chestnut Hill West regional rail line is restored, but the Trenton line is still suspended. Service was restored on the Chestnut Hill West line just after 5 a.m. SEPTA officials said passengers of that line should expect delays. 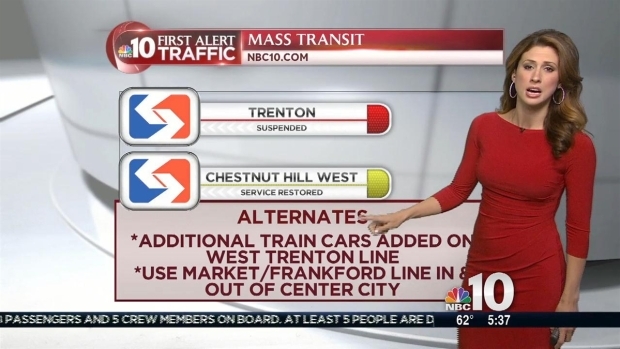 SEPTA officials said additional train cars would be added along the West Trenton line to accommodate Trenton Line passengers looking for an alternate service. Passengers are also encouraged to use the Market/Frankford line as an alternate. Several passengers were left stranded at 30th Street Station due to the deadly derailment and the subsequent cancellations. This story is developing. Stay with NBC10.com for updates.